The next tattoo idea we have to show you is quite unique. 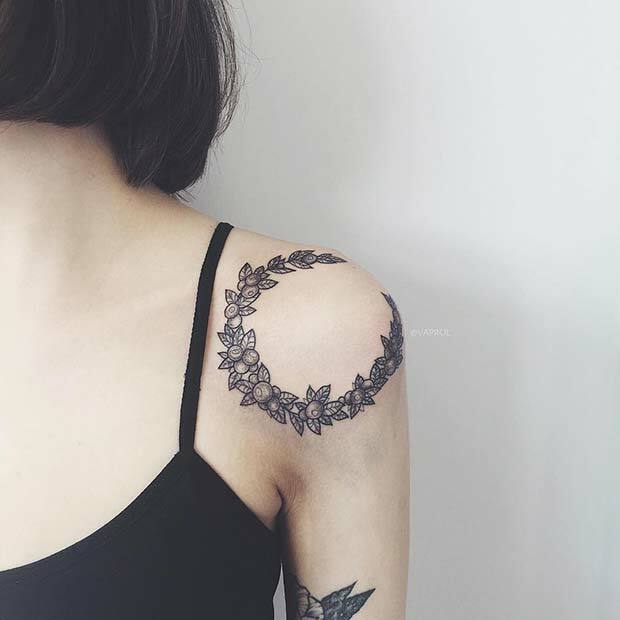 The tattoo is a circle with a botanical design. We love how the circle sits on the shoulder, it just looks so creative and stylish. You can take inspiration from this and have a circle like this with flowers or other patterns. You don’t have to go all out and have a large intricate design. You can choose a simple and stylish tattoo like our next pick. 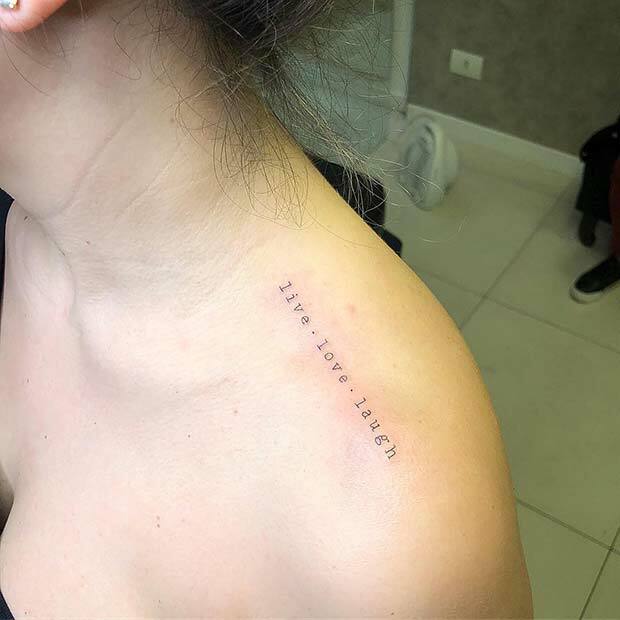 This tattoo features the words live, love, laugh. The positive quote would look great on anyone and you can even experiment with font. Maybe try having your favorite quote or saying tattooed too. Peonies have become very popular in tattoo designs. 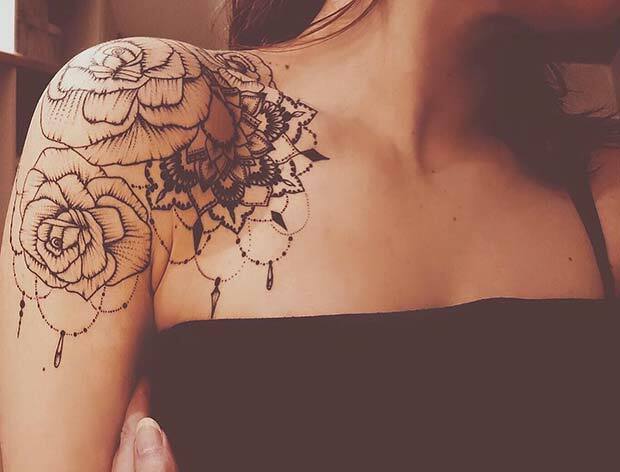 Earlier in the post we featured a vibrant peony shoulder tattoo. 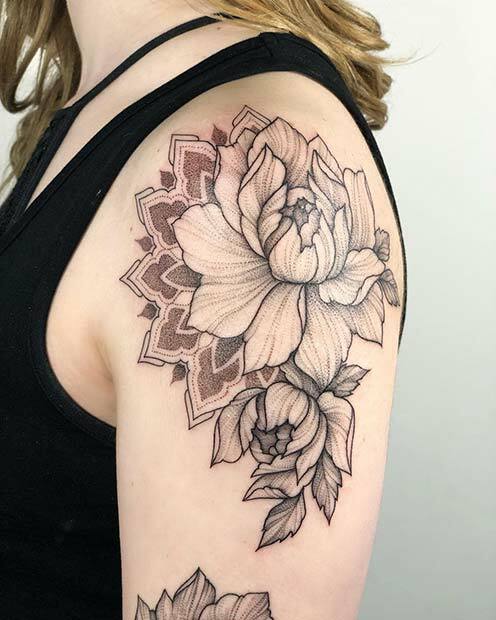 The tattoo below shows how you can design a peony in a different way. This one is black ink and starts on the shoulder and ends on the arm. You can choose one peony or have a design like this one with patterns too. Looking for a unique tattoo design? Then this next pick is for you. 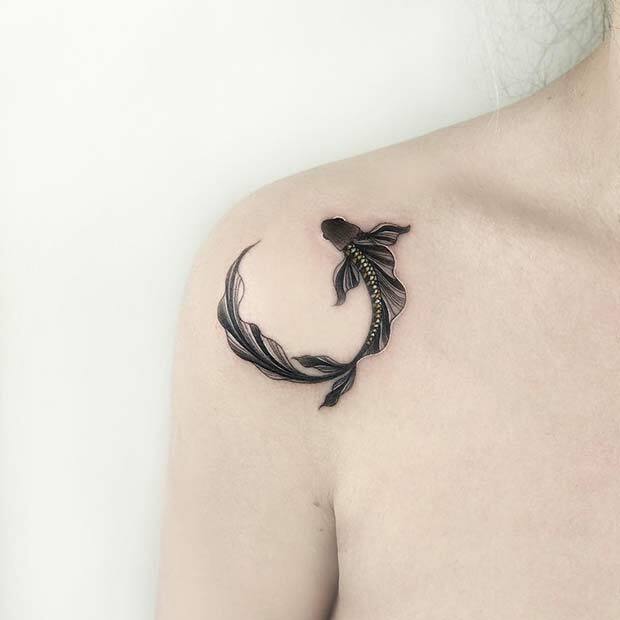 Here we have a koi fish that has been tattooed in a circular shape on the shoulder. Koi fish tattoo can have different meanings but some common ones are wealth, ambition, patience, strength, wisdom and good fortune. If you like this design, have something similar or choose you own favorite fish. Next, we have a beautiful watercolor tattoo to share with you. 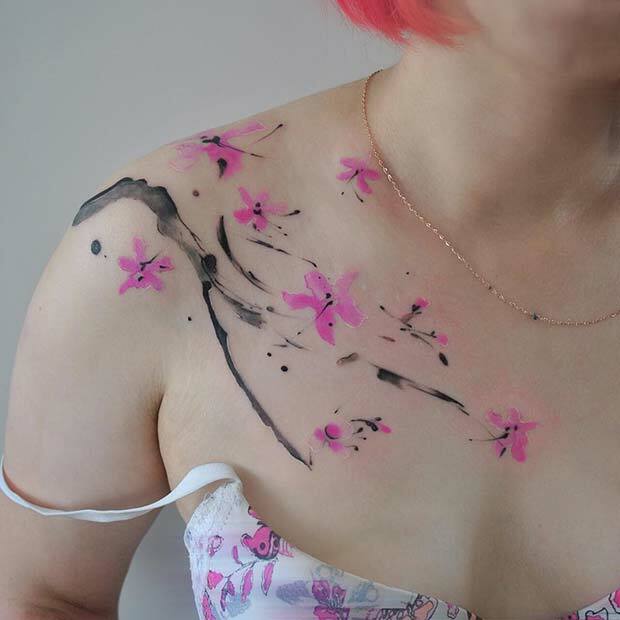 Watercolor tattoos look amazing as they actually look like paintings on the skin. Here we have a watercolor version of cherry blossoms. The blossom starts on the shoulder and ends on the chest. This is a stunning tattoo that would suit anyone. Quotes and names are very popular tattoo choices. Here we have a gorgeous example of this type of tattoo on the shoulder. 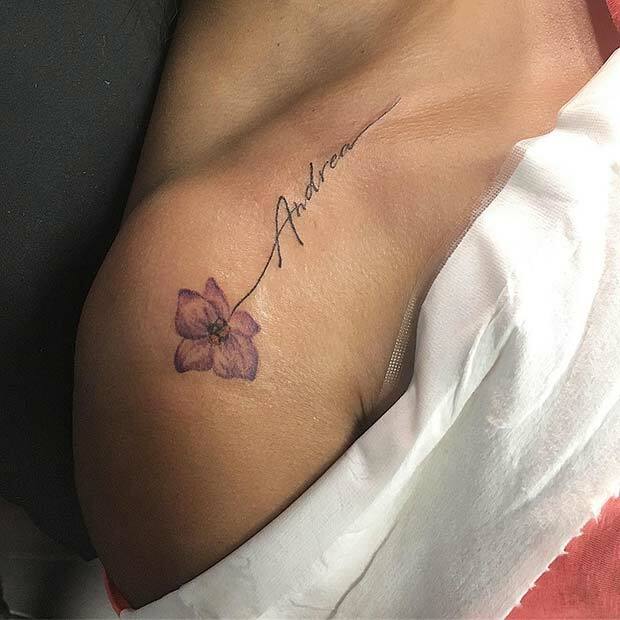 The tattoo starts as a pretty purple flower on the shoulder and the stem ends around the collarbone. This stem is unique though as it has a name on the design. You can have a tattoo like this for a loved one or you can swap the name for a quote. If you want an attention-grabbing tattoo, this next idea is for you. 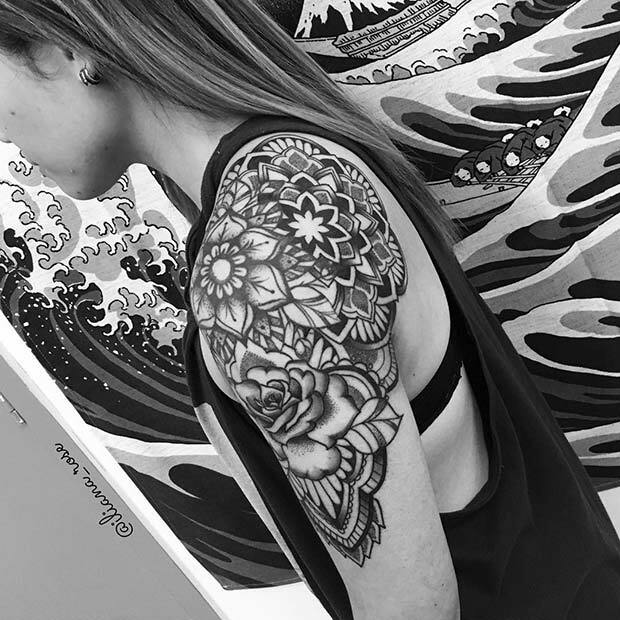 The arm and whole shoulder has been covered in intricate mandala patterns. This is a stunning work of art that would look amazing on anyone. You can get lots of inspiration from this to create your own design, so you can have your own unique tattoo. Next, we have a tattoo idea that combines a few popular designs together. 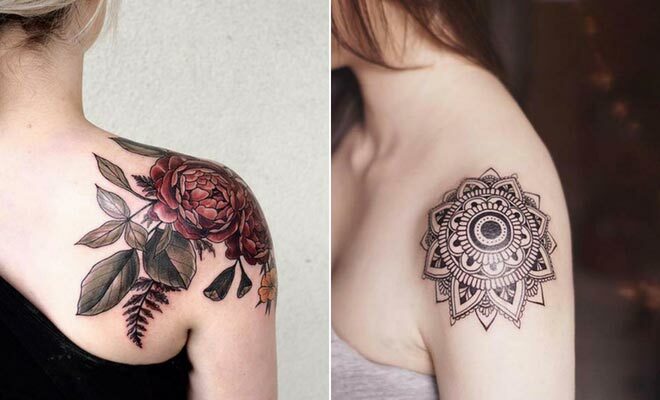 This tattoo has flowers, a mandala and a jewelry feature. These elements look great as they are but make a stunning piece of art when joined together. A shoulder tattoo like this would look gorgeous on anyone. You could even add some color to the design too. Want a small but bold tattoo? Then this next pick is for you. 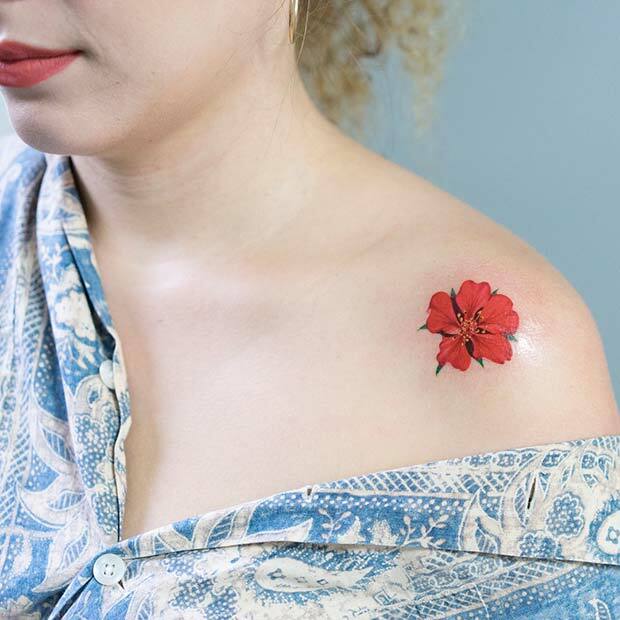 This shoulder tattoo features a small red flower. It is a cute piece that would be great as a first tattoo. You can have a red flower like this one or choose your own vibrant flower. Our next idea is creative and unique. Here we have an olive branch that has been tattooed on the top of the shoulder. 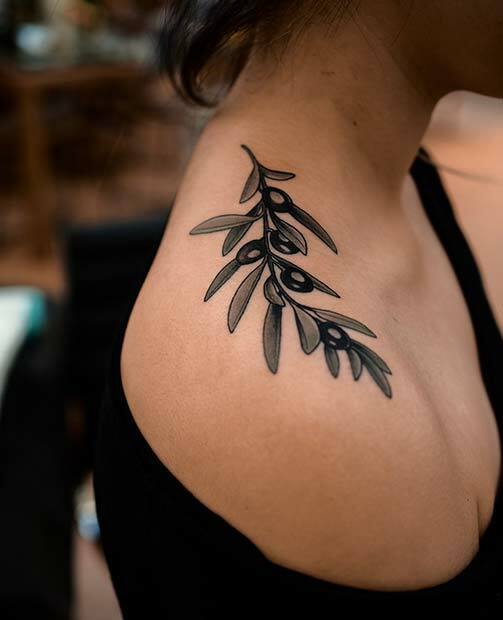 Olive branches look stylish as a tattoo but are also a symbol of peace and fertility. This would be perfect for someone who wants an unusual tattoo with meaning.